Professors Jonathan Feng and Tim Tait Find Evidence for 5th Force of Nature. UC Irvine physicists have released a paper on the possible discovery of a 5th fundamental force of nature. The group includes UCI professors Jonathan Feng and Tim Tait, UCI postdoctoral researchers Bart Fornal, Iftah Galon, and Flip Tanedo, UCI graduate student Jordan Smolinsky, and Susan Gardner, a University of Kentucky professor visiting UCI on sabbatical this year. There are 4 known forces: electromagnetism, weak, strong, and gravity. These are mediated by force carrier particles, like the photon for electromagnetism. 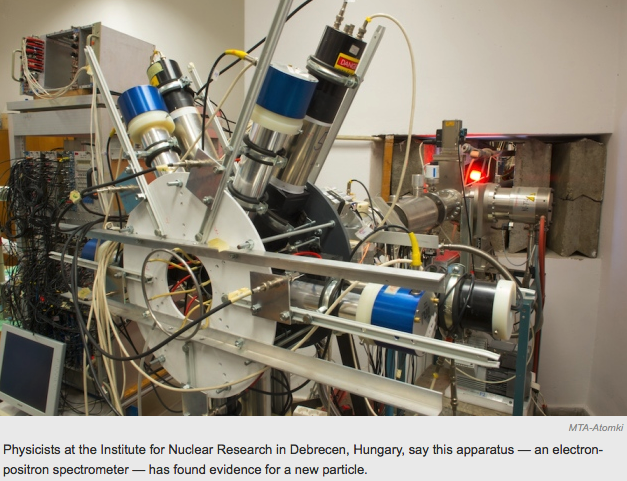 Last year, a group of Hungarian nuclear physicists saw some puzzling anomalies in their experimental data. They postulated that it could be the sign of a new particle, but few people knew what to make of it, and it was largely ignored. On April 25, the UCI research group released a paper showing that the experimental data provided evidence for a new force carrier particle, which would imply a 5th force. Four days later, these results were presented at a gathering of the world's experts on this subject at a meeting at Stanford to standing-room-only audiences. It has now gained much attention, with numerous experiments being proposed to check the Hungarian experimental result. If confirmed, the discovery would revolutionize our understanding of the Universe, with consequences for the unification of forces and dark matter. Professors Jonathan Feng & Tim Tait featured in Nature.com.